Often it is the simplest charms that are best. 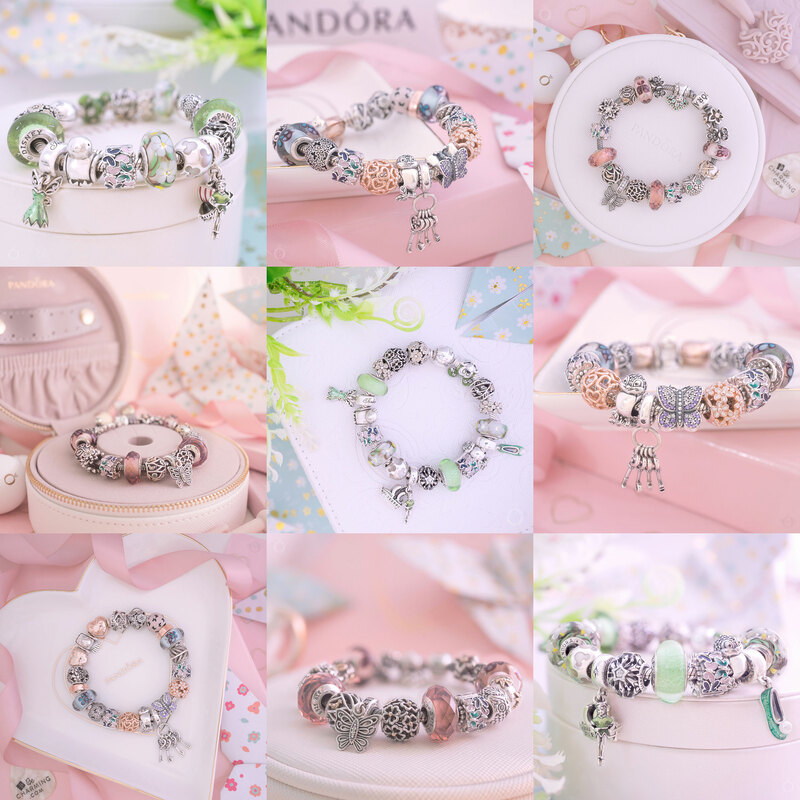 That is definitely true of the sweet Icon of Nature Charm from the PANDORA 2018 Autumn Collection. Harvesttime is one of the main themes of the recent Autumn collection, with charming grain motifs and even a not-so-scary Scarecrow Guardian (767629CZ) pendant. Amongst all the harvest designs, the PANDORA Icon of Nature Charm (797618) is my favourite. Two sheaves of grain fold into each other to form this pretty heart shaped Icon of Nature charm. The grains of wheat have a relaxed alignment which is unsymmetrical and creates an interesting opening at the centre of the charm. Although the Icon of Nature has quite a simple design the magnificent texture of the wheat sheaves are an engaging addition. A beautiful braid of silver surrounds the charms opening and completes the design. Like many of the recent silver charms PANDORA have produced this year, the Icon of Nature charm has a bright shiny finish. There is a slight amount of oxidisation around the edge of the wheat and I am hoping it will darken a little with time. It was quite tricky to locate the hallmarks on the PANDORA Icon of Nature charm but I finally spotted them hidden beneath the charm. The standard PANDORA hallmark ‘ALE’ and ‘S925’ are engraved on either side. Although, the Icon of Nature charm features wheat sheaves ready for harvest, it is a versatile charm which and can be worn all year round. As nature is a favourite theme of mine I decided to highlight this by creating a styling for each of the four seasons in my review of the Icon of Nature charm. As Spring begins to peep its head, each day starts to feel a little warmer and longer. The warm blush of the PANDORA Rose Smooth Moments Bracelet (580728) illustrates the warmth of a pool of sunshine as bulbs burst forth. A soft rose coloured glow surrounds the Icon of Nature charm, making the cold of Winter yesterdays memory. Dazzling at the centre of the bracelet the PANDORA Rose Iridescent White Glass Murano (787576) mimics the shimmering wings as insects awaken. A hint of green leaves from the wonderful Wildflower Murano (791638cz) charms lift the design and the white glass flowers blend with the pretty enamel detail on the PANDORA Rose Darling Daisy Meadow (780004EN12) and Primrose Meadow (791488EN12) charms. Read our recent review of the PANDORA Rose Iridescent White Glass Murano for more styling inspiration. 'Just living is not enough... one must have sunshine, freedom and a little flower' - Hans Christian Andersen. The summer styling of the Icon of Nature charm is a perfect hot house of colours set on the light PANDORA Mesh Bracelet (596543). Centred between the Green Petite Facet (791499SGQ) and glittering Ocean Mosaic Pavé (791261MCZMX) charms, the vibrant fuchsia Orchid Pendant (791554EN69) provides an exotic summery feel. Both the Promise of Spring (797046) and Ariel’s Signature Colour Murano (791641) charms produce symmetry to this design. A final punch of pink is added with the Cerise Encased in Love (792036NCC) and Fuchsia Shape of Love (796563NFR) charms. Petite Facet charms are ideal for adding a splash of colour to your bracelet and currently the Green Petite Facet charm is for sale at the special price of $35 on BeCharming.com. Plus the gorgeous glow in the dark Ariel’s Signature Colour Murano is now £28 in the outlet on the PANDORA UK eStore. 'Nature does not hurry, yet everything is accomplished.' - Lao Tzu. When thinking of Autumn I picture shades of warm orange, vivid red and golden brown, so the PANDORA Sliding Leather Bracelet in Golden Tan (597225CGT) seemed the perfect choice for this Autumnal look. Generating a hive of beauty at the centre of the bracelet the PANDORA Shine Queen Bee Pendant (367075EN16) hovers between the Golden Honey (767120EN158) and Honeybee (767023EN16) charms. Stunning textures from the Edelweiss (791176CZY) and Icon of Nature charms add intrigue to this style and the Golden (796327EN146) and Rose Glitter Ball (796327EN145) charms create warmth. 'The poetry of earth is never dead.' - John Keats. 'If you truly love nature, you will find beauty everywhere.' - Vincent Van Gogh. Finally the cool breeze of Winter approaches leaving this chillingly beautiful design in its wake. Set on PANDORA’s revolutionary Open Bangle (596477) the PANDORA Disney Cinderella’s Wish (791592CFL) charm sparkles brilliantly between the spectacular Ice Drops (796365CZB) and Cinderella’s Signature Colour (791640) Murano charms. Opposite the bright silver Icon of Nature charm the Heart of Winter (791996CZ) charm shimmers with its glittering icicles. My verdict on the PANDORA Icon of Nature charm? A natural beauty! This fantastic charm very nearly gets full marks from me! As shown by the four styles above, the gorgeous design is very versatile and it also has an attractive price tag. The only area that I haven’t given the Icon of Nature charm 10/10 is for ‘Wow factor’ as I consider it to be more of a supporting charm than a centre piece. Overall though I fully recommend this natural beauty! In the UK the PANDORA Icon of Nature Charm (797618) is £25 and is available from the PANDORA UK eStore.